I shared some academic research last year showing that top-level inventors are very sensitive to tax policy and that they migrate from high-tax nations to low-tax jurisdictions. Now we have some new scholarly research showing that they also migrate from high-tax states to low-tax states. Let’s look at some of the findings from this new study, which was published by the Federal Reserve Bank of San Francisco. We’ll start with the issue the economists chose to investigate. …personal taxes vary enormously from state to state. These geographical differences are particularly large for high income taxpayers. …the average tax rate (ATR) component due solely to state individual income taxes for a taxpayer with income at the 99th percentile nationally in 2010…in California, Oregon, and Maine were 8.1%, 9.1%, and 7.7%, respectively. By contrast, Washington, Texas, Florida, and six other states had 0 income tax. Large differences are also observed in business taxes. …Iowa, Pennsylvania, and Minnesota had corporate income taxes rates of 12%, 9.99%, and 9.8%, respectively, while Washington, Nevada, and three other states had no corporate tax at all. And not only do tax rates vary substantially across states, they also vary within states over time. …If workers and firms are mobile across state borders, these large differences over time and place have the potential to significantly affect the geographical allocation of highly skilled workers and employers across the country. Here’s a map showing the tax rates on these very successful taxpayers, as of 2010. Many of these states (California, Illinois, New Jersey, and Connecticut) have moved in the wrong direction since that time, while others (such as North Carolina and Kansas) have moved in the right direction. Anyhow, here’s more information about the theoretical issue being explored. Many states aggressively and openly compete for firms and high-skilled workers by offering low taxes. Indeed, low-tax states routinely advertise their favorable tax environments with the explicit goal of attracting workers and business activity to their jurisdiction. Between 2012 and 2014, Texas ran TV ads in California, Illinois and New York urging businesses and high-income taxpayers to relocate….In this paper, we seek to quantify how sensitive is internal migration by high-skilled workers to personal and business tax differentials across U.S. states. Personal taxes might shift the supply of workers to a state: states with high personal taxes presumably experience a lower supply of workers for given before-tax average wage, cost of living and local amenities. Business taxes might shift the local demand for skilled workers by businesses: states with high business taxes presumably experience a lower demand for workers, all else equal. We focus on the locational outcomes of star scientists, defined as scientists…with patent counts in the top 5% of the distribution. Using data on the universe of U.S. patents filed between 1976 and 2010, we identify their state of residence in each year. We compute bilateral migration flows for every pair of states (51×51) for every year. We then relate bilateral outmigration to the differential between the destination and origin state in personal and business taxes in each year. 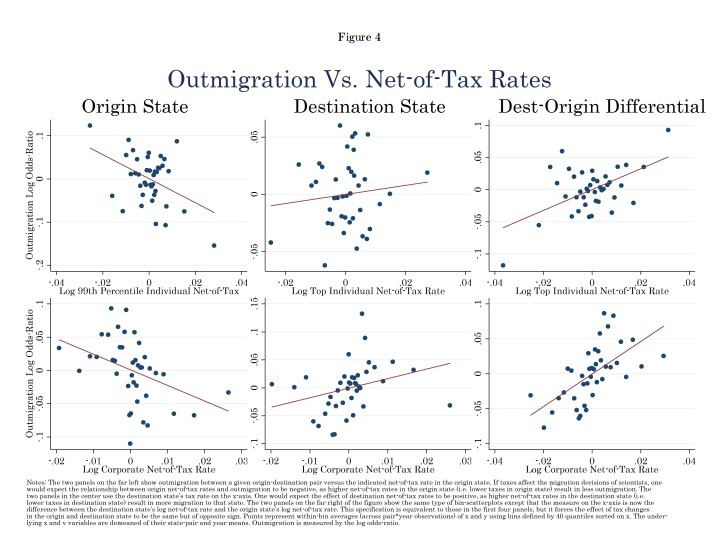 …Our models estimate the elasticity of migration to taxes by relating changes in number of scientists who move from one state to another to changes in the tax differential between the two states. So what did the economists find? Given all the previous research on this topic, you won’t be surprised to learn that high tax rates are a way of redistributing people. We uncover large, stable, and precisely estimated effects of personal and business taxes on star scientists’ migration patterns. …For the average tax rate faced by an individual at the 99th percentile of the national income distribution, we find a long-run elasticity of about 1.8: a 1% increase in after-tax income in state d relative to state o is associated with a 1.8 percent long-run increase in the net flow of star scientists moving from o to d. …To be clear: The flow elasticity implies that if after tax income in a state increases by one percent due to a personal income tax cut, the stock of scientists in the state experiences a percentage increase of 0.4 percent per year… We find a similar elasticity for state corporate income tax… In all, our estimates suggest that both the supply of, and the demand for, star scientists are highly sensitive to state taxes. Wonky readers may appreciate these graphs from the study. For everyone else, the important lesson from this research is that high tax rates discourage productive behavior and drive away the people who create a lot of value. Two years ago, I shared some research showing that entrepreneurs flee high-tax nations to low-tax jurisdictions. Now we know the some thing happens with top-level inventors. And let’s not forget that it’s even easier for investment to cross borders, which is why high corporate tax rates and high levels of double taxation are so damaging to U.S. workers and American competitiveness. P.S. I don’t expect many leftists to change their minds because of this research. Some of them openly admit they want high tax rates solely for reasons of spite. Sensible people, by contrast, should be even more committed to pro-growth tax reform.